WONDER WOMAN is a comic book fantasy adventure where Diana, the princess of the Amazons, has always longed to fight and protect those who can’t protect themselves, so, when a war plane lands near her isolated island, she finds an opportunity to help the world. WONDER WOMAN is an exciting movie that’s very well made, with strong redemptive, moral elements, but there are references to Greek gods and other elements requiring strong caution. 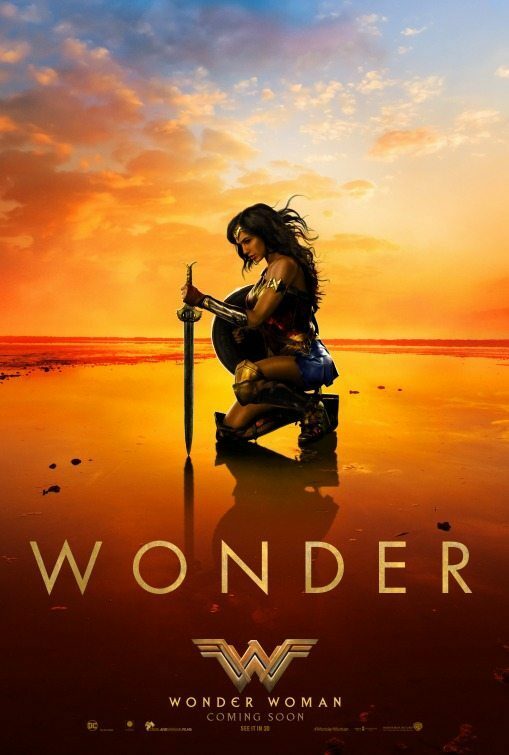 WONDER WOMAN is a comic book fantasy adventure where Diana, the princess of the Amazons, has always longed to fight and protect those who can’t protect themselves, so, when a war plane lands near her isolated island, she finds an opportunity to help the world. WONDER WOMAN is an exciting movie that’s very well made, with strong redemptive, moral elements, but there are references to Greek gods and other elements requiring caution. Princess Diana of the Amazons has always longed to fight, even when she was a young girl. Her mother, Hippolyta, the Queen of the Amazon women, doesn’t want her to learn how to fight, but Diana sneaks out at night to do so. Years pass, and Queen Hippolyta allows Diana to be trained by Antiope. Diana becomes extremely powerful, but still doesn’t understand how powerful she is. One day, Diana sees a plane go down in the water and jumps in to save a man named Steve Trevor. Steve’s plane is being followed by the Germans, who also come into the Amazon waters. The Amazon woman try to fight the Germans, but the battle results in Antiope’s death. The other women take Steve and put a magical rope around him that makes him tell the truth. Steve finally admits he’s a spy fighting in World War 1. He spied on the Germans and stole a book from the mad female scientist, Dr. Maru, who’s been making a poison gas to kill thousands of people. The book explains all the work she’s doing, and Steve’s plan is to get it back to the British army to tell them about Dr. Maru’s dastardly plans. When Diana hears Steve’s story, she believes that the god of war, Ares, is the one responsible, just like the stories she’s always been told. Diana can’t just let Ares kill woman and children. She believes that, if she kills Ares, she will stop the war. Diana’s mother doesn’t want her to go, but finally lets Diana leave, saying she may never return to Paradise Island. Diana and Steve go to London and meet the political and military leaders, where Steve pleads with them that they must stop the plans of Dr. Maru and Captain Ludendorff, her boss. Instead, they would like to just wait it out until the Armistice occurs. Riled up, Diana doesn’t believe they’re doing the right thing. She tells them they must sacrifice for people and fight for those who cannot fight, for the woman and the children. Steve is able to pull her out, and they both decide to go to the front lines to stop the plan to release the gas and stop the Armistice. WONDER WOMAN is well made, with good directing and a thoughtful plot line. The only note to mention is some of the origin story goes on a bit long, though this eventually isn’t a big issue. Gal Gadot does a good job playing Diana, as does Chris Pine as Steve Trevor. Overall, the visual effects are extremely well done. This WONDER WOMAN has a strong pagan worldview featuring Greek mythology involving Greek gods and demi-gods. However, the Greek mythology is mixed with very strong moral elements and an overarching Christological allegory featuring sacrificial love and good overcoming evil. For instance, Zeus is a father figure who creates man in his image [SPOILERS FOLLOW]. If you don’t know the original DC Comics about Wonder Woman, Diana turns out to be Zeus’ child and is there to save the world, while Ares, the god of war, turns out to be the Devil, deceiving and manipulating people to destroy the world for his own ends. Diana believes her purpose is to save those in need, to bring peace and love, and specifically to fight Ares (Satan). In the end, it’s clear that people have both peace and war in them, light and darkness, and that they must choose to believe in the light. Though this is the case, the movie does say there are multiple Greek “gods.” In that light, a line of dialogue says that only a god can kill a god. There are also some light politically correct elements, but they are kept to a minimum. Also, the movie has a few off-color double entendres that include talk about human biology, men and women getting together, marrying and eventually starting a family by having babies. One of the jokes involves an allusion to possible lesbianism, but it’s vague enough that it avoids objectionable details. The movie also has some intense action violence and fighting, though it’s not gruesome, and brief but light foul language. Ultimately, WONDER WOMAN promotes sacrificial love and says that love can help people overcome the darkness inside them. That said, MOVIEGUIDE® advises strong caution when it comes to the new WONDER WOMAN movie. (PaPa, CC, BBB, PP, Ab, PC, Fe, Ho, L, VV, S, N, AA, M) Explicit but mixed pagan worldview with pagan elements and references to Greek gods, including Zeus and Ares, and protagonist is told she’s born of a god and thus can kill another god using a magical weapon, but combined with strong Christological, moral, patriotic elements extolling sacrifice, the idea that belief or faith can direct your path, good overcoming evil, compassion, patriotic duty, the goodness of trying to end a brutal war, doing the right thing no matter the circumstances, some Christological allegories, a group of men kneel down and pray, mentions of prayer, protagonist learns how to love through sacrifice, and a church is in several scenes, and a negative comment about marriage, plus some light politically correct moments and a feminist subtext but it falls short of being really radical, and there’s two or three light but vague and infrequent lesbian implications and possible allusions surrounding the island of women from which the protagonist originates; five obscenities and one light profanity; strong action violence with very little blood includes man falls out of plane, multiple fight scenes with sword fighting and guns, two powerful characters battle one another and cause huge destruction, Wonder Woman storms the German lines and leads an attack in a lengthy battle scene to save people in a village, woman has a marred face, many explosions, many soldiers are killed or fall during World War I battle scenes, and people are thrown about during war scenes; some light sexual content includes comments that intimacy should be within marriage, but movie also implies characters do sleep with each other, and a man lives a bachelor life and says a negative comment about marriage, but then learns to love, man and woman go to a room at night and start to kiss but there’s no bedroom scene before and after, female protagonist says a woman might need a man for procreation but not for “pleasure”, but her statement is left vague; woman accidently enters and sees a man taking a bath, audience see his behind as he steps out of the bath and covers himself, and there are a couple light double entendres of his nakedness (the man and the woman pretend to talk about the watch his father gave him; the woman has never seen a watch), protagonist and female soldiers wear Greek military skirts (as you see in the WONDER WOMAN comics); some alcohol use, and a character is drunk at a bar; no smoking or drug use, but villain takes a potion that makes him more powerful; and, lying and deceit done by villain so it’s rebuked, some sexist attitudes by government officials in parliament toward a woman being in their presence while they discuss important issues, heroine disobeys her mother about going to stop a war but eventually convinces mother she should go, and heroine lives to fight to protect others. WONDER WOMAN is a comic book fantasy adventure movie about the famous female superhero. As princess of the Amazon women, Diana longs to fight evil and protect those who can’t protect themselves. When a plane lands in the water, she finds her opportunity to help the world. Diana saves Steve, the man on the plane. Steve admits he’s a spy fighting against the Germans in World War I. He stole a book from a mad female scientist, Dr. Maru, who’s making a poison gas to kill thousands. Diana can’t just sit by and let all those people be killed. So, she joins Steve in defeating Dr. Maru and her evil plans. WONDER WOMAN is an exciting adventure that’s well made, with good directing, a thoughtful story and a powerful performance by Gal Gadot in the title role. Despite the movie’s inherent feminism and references to Greek gods, WONDER WOMAN has strong redemptive, moral elements promoting sacrificial love and containing an overarching Christological allegory. However, WONDER WOMAN also has lots of action, war violence and some off-color humor. So, MOVIEGUIDE® advises strong caution. This Remarkable Young Woman Is Taking The World By Storm.